Chuck, It looks like a convoluted pogo stick with a really nice paint job. '92 Cannondale Beast of the East frame, xt hubs, xt front deraileur, sachs rear der. grafton cranks, dia-compe 996 brakeset. About 20lbs. wish i still had it. 1991 Pace Research RC100 CNC milled Sq tube frame with greaseguard points, XC pro groupset, Bullseye cranks, RC20 chainrings, Magura's (4 finger), Pace RC50 hubs and Pace RC30 forks with 1 piece steerer-stem. all finished off with original grey with dayglow yellow forks & stem. 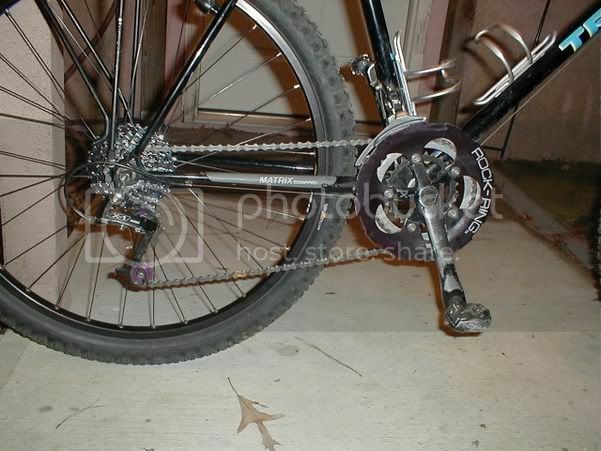 just installed a new rear wheel, cassette and chain on my Trek. went from the venerable (read decrepit and rebuilt too many times) original SunTour freewheel on a Sansin hub/Matrix rim wheel to a SRAM PG-730 cassette on a PowerTools hub/Sun CR18 rim wheel. only thing i expect to miss is the chain (old-school Sachs), which i replaced with a KMC. shifts pretty good, considering. the sprocket spacing doesn't appear to make much of a difference, probably since the cassette is a lot more sophisticated than the crude flat gears on my old freewheel. looking forward to riding it, since it's a pretty big change in gearing too. the front is unchanged (duh), at 49/40/28. but the back has gone from 14/15/17/20/23/26/30 to 12/14/16/18/21/26/32. just from my initial test ride, i'm stoked about the new range - particularly the 32-tooth low. Meet Snidely Whiplash. '89 Trek 970 frame made into an all-rounder in the style of a Bridgestone XO-1. I had mentioned in an earlier post that we own a 1989 Nishiki Ariel. I've attached a few pictures of the bike. These pictures show it with the replacement, Suntour suspension fork, Bontrager saddle and Bontrager MUP tires. This is a pre-Cunningham era Nishiki, with a more conventional frame than the Cunningham design. The booklet in the pictures is the original owners manual. The original deraileurs are Shimano Deore as are the pedals, shift levers and cantilever brakes. The rear freewheel is shimano 6 speed but I can not tell if it is original or replacement. The chainwheels are Shimano Biopace. This bike is ridden weekly on the local MUP and is used by my youngest son on MTB trails. I'm thinking about restoring the bike with the original fork, seat and Nishiki pedal clips. Last edited by roccobike; 04-12-06 at 10:09 PM. ^^^^ i hate you soooo much. but i love your Fat Chance. Do you know the weight? Nice bikes. Let me know when a '94 or a '96 would be considered vintage, and I'll post. awesome bikes! I have a mid 80's Bridgestone(MB). Nice lugged frame, suntour comps, painted purple and white. I don't recall the MB#. I bought used in '85 and rode the hell out of it. It did what it was meant do. It's hanging in the garage after it was retired. Hope to rebuild and start commuting with it this spring. I now commute on a mid 80's Spec. Stumpjumper. Love those old mnt bikes. Your front porch is waaaay better than Pogue's. Do you ride all of those fine machines? 1986 Schwinn Sierra in Black Chrome, bought new in 1986. I'll try and find a picture of my 1980 Specialized Stumpjumper. Had the bike since it was new and have retrofitted it with a Judy fork and newer brakes. Still have the old fork and brakes. Most of my off road riding today is on a Scapin MTB. Which is a fraction of the wt of the SJ. A question for the group: I'm hitting the Westchester, MD swap meet tomorrow and first priority is to find an old mountain bike (it'll be my first, I've never done anything other than road riding up to this point) - most likely looking for what's being showed here. Anyone care to give any advice? I know absolutely nothing about these things, having been out of cycling between 1977 and 2005. Ritchey, Moots, Ibis, Fat Chance, Santana, maybe early Klein Mountain, and any other early American builders are the ones that I'm thinking are the best investment, especially in terms of historic importance (yeah, there is such a thing in bicycle collecting). The very early ones have already been recognized as such, so if you luck into one, get it! Some of the early ones like Ritchey make for a pretty good off-road ride, too, if you can let go of the ultimate control that a disk-brake, double boinger gives you. Think of 'em as skill builders. and I think some historically-important mass-produced bikes are there as well, like the early stumpjumpers (especially that Pink Stumpjumper Team - if you run across one of those, buy it for me!) and the paramountains from schwinn. There was a nice writeup of vintage mountain bikes in a recent Bicycling or Mountain Biking magazine, wasn't there?. Very cool stuff. i'd have bought it, but it was too big for me. It sounds to me like sykerocker is looking for a rider, not an investment. I like the Bridgestone MB-1 and MB-2. I also think that the early rigid Treks are under rated. They made a lot of them, so you can get them cheap. I have a Bridgestone MB-2, a Trek 850 and a Trek 930. I think that the cheapest one, the 850 is the best ride.